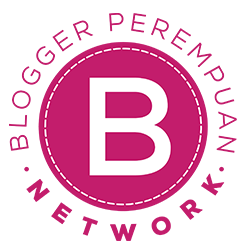 My skin type is oily, especially in the T-zone area. For your info, The T-zone area is the part of your face consisting of the forehead, nose & the area around your mouth, including the chin. It's so named because it's shaped like the letter 'T'. 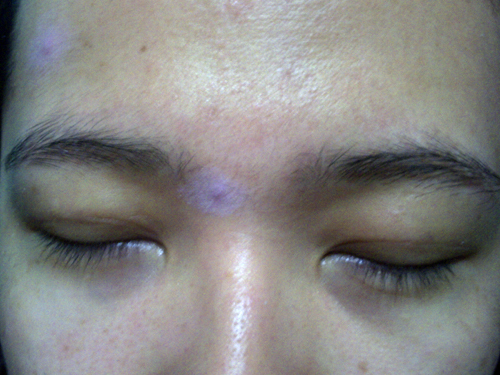 Bad news for me, little pimples (& the big one too) is easily appears in the T area. Like you can see in the pic below, small red pimples starts show up in my oily face *oh nooooo*. 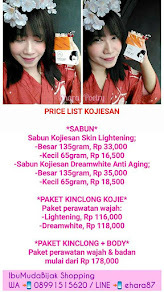 FYI Beauty Lines is Indonesian online shop on facebook, who sell ready stock or pre order cosmetics from Korea (Etude House, SkinFood, Face Shop, Tony Moly, Holika-holika & many more) even you can buy cosmetics sample here! 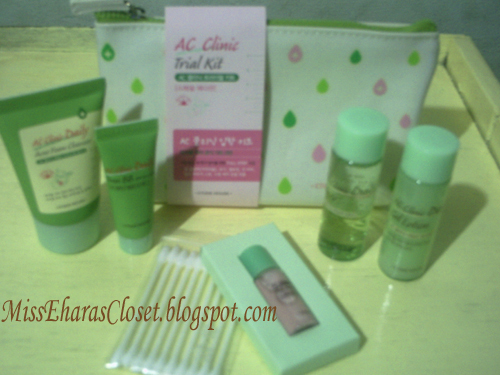 I got AC Clinic Trial Kit + Pouch (New 2013) from them. Etude house Korea already discontinue the old 'AC Clinic Trial Kit' & now release the new AC Clinic Trial Kit + Pouch (New 2013). The pouch size maybe small but can keep all product in this kit. The pouch made by good quality material & the design pattern is cute. This new trial kit already include with AC Clinic Daily Sun BB SPF30/PA++. "AC Clinic Daily Acne Foam Cleanser 30 ml"
This is the basic from the treatment, 1st wash your face with this facial foam. Release proper amount & make a rich lather with lukewarm water. Massage lather onto face & wash off with lukewarm water. 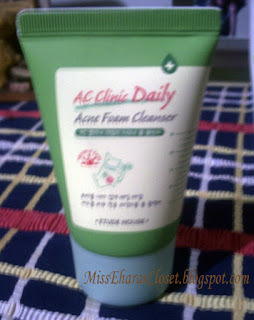 "AC Clinic Daily Toner 25 ml"
After wash your face & dry it with soft towel, apply toner to your face & gently tap for absorption. Some people say AC Clinic Daily smell very strong (kinda smell like the herbal medicine) but weirdly I love the smell of the toner. 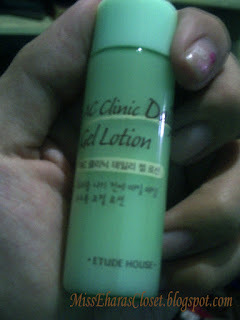 "AC Clinic Daily Gel Lotion 25 ml"
The lotion is a bit watery but I have a difficult to get the thing out of the bottle! I have to take it out side-ways so it would release the amount of lotion I want. 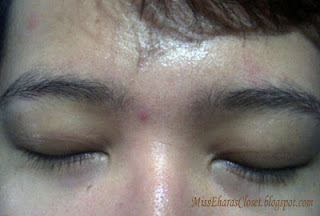 Apply gel lotion after toner, a small amount of gel lotion enough for whole face. 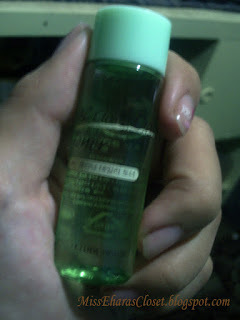 It's very light lotion & not oily at all (maybe because this product oil-free). 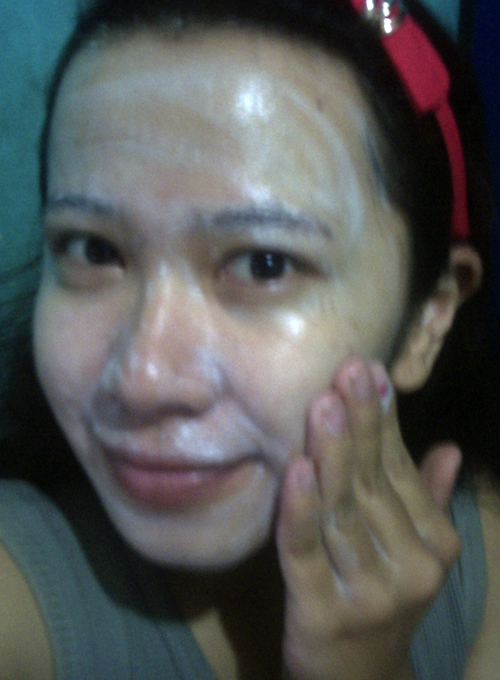 It doesn't get my face became oily, in fact my face feels a little dry in cheek area. 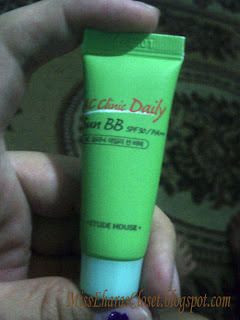 "AC Clinic Daily Intense Pink Powder Spot 5 ml"
"AC Clinic Daily Sun BB SPF30/PA++, 8 gr"
BB swatch on my hands.....sorry if the picture is not clear :-( bad camera! There you go. That's my simple review about AC Clinic Trial Kit from Etude House. This review is basicly from my own personal experience using this product. I've been used it for 7 days & my red pimples started disappears. 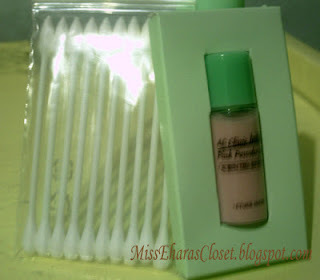 I'm going to continue using this product until it all runs out & decided to buy this product again or not...later! ( ´ ▽ ` )ﾉ Thank you for reading my review. Sorry for my bad english & maybe mistyped. I review & write with my own language, hopefully you all like it! Have you ever try this product? Did it works to you? how much did u spend for the etude house ac clinic trial kit? where i can find the item? 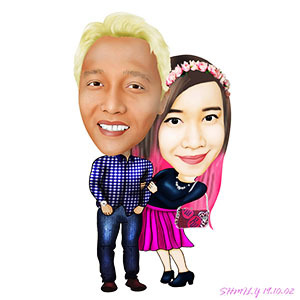 hai,,im sorryyyyyyyy for late reply (>_<) I missed your commet..